I have had holster for about 4 months. I have several other holsters. This one by far is my favorite. Never use the others since receiving this one. Love it. Just ordered another for different gun. Will probably order again. Great company! I was skeptical about this holster at first because I first saw the add on Facebook. However, it kept popping up in my feed so I decided to take a closer look at it. It turns out it was exactly what I was looking for. I bought two of these holsters using the fitment guide on the website according to the pistols I have. This is the best holster I have ever owned. It is comfortable, sturdy, concealable, and the magnet is incredible. This holster didn't even need a break in period like some of the others I bought in the past. I attached it to my hip right away and very easily, and after the initial excitement of having a new holster, I didn't even realize I was still carrying. I have showed all of my friends this holster and have told them all about it and now they are ordering them as well. This holster was made for all day carries and I don't have to worry about my gun falling out, but yet I can still draw with out any trouble and very quickly. I swear by your holsters and you have a new lifelong purchaser. Keep up the great work JM4 Tactical. Now you need to start making purses for women with this same concept. My wife will be the first one to test them out for you or purchase one. Thanks for a great product! I love this holster! The color is amazing! Great craftsman ship! I will recommend this holster to anyone! Very good holster. You can tell it is made of quality material. I like the overall design with the magnetic retention which works really well. I only really have two cons with this holster. The first being that with a lot of the clothing I wear, the magnet prints a little more than I would like. My second con is that it rides lower than I thought. So while it's great for concealing my handgun, it's harder for me to get a good purchase on it when I draw. That's just personal preference though, and in hindsight I would (and probably will in the future) get the high ride version. Overall though it is a great holster and I do recommend it. Quality construction and design. I like the versatility afforded by the magnets. ie, I can easily secure the firearm in my car, well concealed with no drilling/screws or hang it right here on my file cabinet or desk. My ony issue is not with the holster but with my choice. 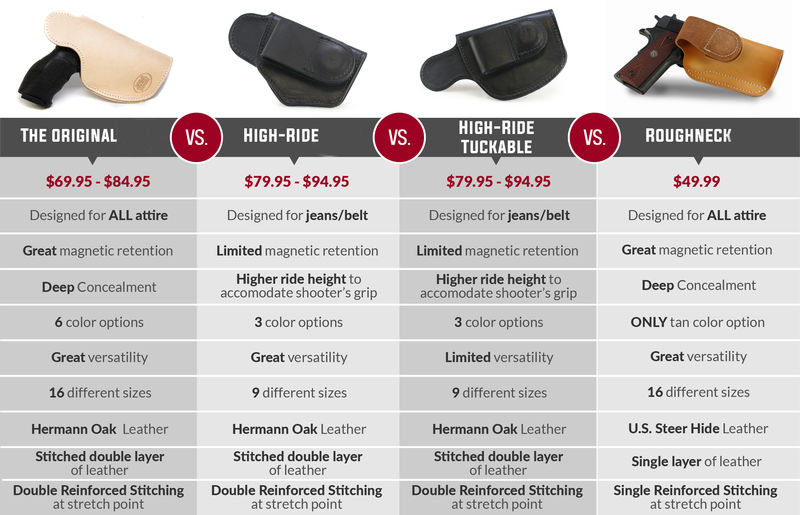 This holster, The Large Original Magnetic Quick, Click, & Carry Holster does very well carried in pants with no belt or a small belt. As I am accustomed to carrying IWBA, I notice that the reveal of the handle feels somewhat lower because of the placement of the strap/magnet. To do over, I would probably order the high ride holster which places the magnets lower resulting in a higher positioning of the grip. I may order a high ride in the future. Just got mine the other day and SEEMS to be all its cracked up to be. Quality built piece, very nice leather, and the magnets really hold my M&P Shield firmly and the belt clip magnet keeps it right where I put it. Really quit impressed all in all. Only reason I gave it 4 stars and not 5 is that its still new, we'll see what I'd give it 4-6 months but I'm guessing it'll be a 5 star. I carry a XDS 3.3 9mm and used to use a hard iwb holster since I bought JM4 it's like I'm carrying a different gun , way more comfortable and carry friendly . I will not go back unless it doesn't hold up. Time will tell but so far I love this product, Thanks for a quality product and super fast (two day delivery from order) service. I wasn’t looking for a new holster. I didn’t even know I needed a new one, until I saw this little guy advertised. Instantly piqued my interest, so I took a chance. Extremely happy with the product. Amazing retention, easy draw, and incredible diversity for mounting and wearable options. The ONLY issue I have would be returning the weapon to the holster after drawing while IWB, which is really a non-issue. Beyond that, it’s a perfect product. Absolutely recommend. This is a great holster that fits my XDS 3.3 9mm like a glove. Very powerful magnet keeps gun in holster secure but I can easily draw my gun out without dragging the holster too. I can take out the holster from my hip and place it inside my car underneath the steering wheel with so much ease. Love this product. Worth the money.